HOME ＞ ENGLISH ＞ E.S.C. 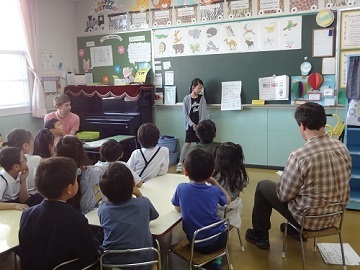 International Yamanote Kindergarten wants to have lots of it students travel the world through learning English. In order to reach this lofty goal the Kindergarten offers graduates English lessons for children up to the 5th grade to continue their studies. In ESC the children are able to increase their listening, speaking and writing skills in an all English environment. 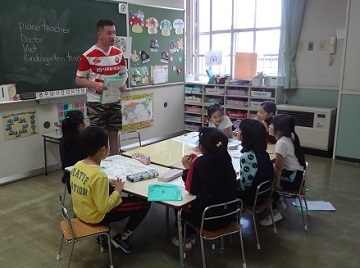 Most important during the lessons is the ability to use English in a fun and interesting environment. The lessons make use of a text books that are targeted at their levels, along with phonics activities and reading and writing exercises. During the year there are also 3 party lessons where the different classes are joined together so they can all enjoy games, crafts and activities together. Those students who complete 5 years of ESC receive a fantastic plaque commemorating their achievement. Classes cover a variety of topics on a monthly basis. They will include things like the arts, science, animals, and more. Children will have more chances to speak English, while also working together to expand their horizons. Teachers will also rotate on a monthly basis. At the end of each topic month, classes will come together to present their findings to each other, in English of course! 1st year students have their own classes, where they can learn together with their old classmates. 2nd and 3rd year students will be mixed together to encourage speaking with more people. Older students will be mixed, allowing for new friendships and English improvement. Speaking activities are the main thing, in an effort to stimulate the children’s thinking. ESC will become a real English environment, pushing the children to try harder while rewarding them for their progress. Opportunities will even arise for the kids to communicate their own needs and interests, for things like crafts! For listening, a variety of challenges will be put to the children. At the highest levels, kids will be tasked with listening along with popular English songs, whilst lower level children will need to follow along with short messages or quizzes. Writing has become a key part of ESC recently, and going forward, it will help form the cornerstone of homework exercises. It will come into play for the aforementioned presentations, as well. Reading will be focused on more than in the past, with passages practiced in class, and featured in homework. Over the course of a term, students will even have read their way through an entire short story!